Traverse City – Taste the Local Difference®, Michigan’s local food branding and marketing organization, has launched the Harvest Haiku Challenge in partnership with Blackbird Arts TC and Michigan Writers. The poetry contest opened for entries on October 1 with a deadline of November 15, 2016. Haiku are a form of Japanese poetry. Each haiku is spare in design, expressing a single emotion or impression in seventeen syllables of unrhymed words on three lines with five, seven, and five syllables on each line, respectively. The short poems are often related to the natural world. The emphasis for this contest will be on celebrating the many facets of Northern Michigan’s harvest season. Ann Arbor – Taste the Local Difference®, Michigan’s local-food branding and marketing program, will publish its TLD Guide to Local Food in Southeast Michigan starting Thursday July 14th, 2016. The new magazine-format guide will cover nine counties across the region. Taste the Local Difference® (TLD) has become an iconic brand, helping to market and sell local food in Michigan for more than a decade. Its mission is to “help food businesses and the communities they serve benefit from the economic value of local food while making fresh, healthy, local food available to all.” TLD first appeared in 2004 as a small booklet listing farms and restaurants in five counties around Grand Traverse Bay. Since then it has grown to include a robust set of online, mobile, and print resources for local food businesses across the state. Its annual Guide to Local Food magazine will now have a special printing for Southeast Michigan. In 2016, TLD began offering its services to the local food community in Washtenaw County through an ACT 88 economic development grant. TLD has since expanded those services to eight other counties including Oakland, Macomb, Wayne, Monroe, Ingham, Livingston, Jackson and Lenawee counties. The new TLD Guide to Local Food in Southeast Michigan will include maps and listings of farms, farmers markets, and food businesses, making it easy for consumers to find locally grown and produced food. In addition to the nine counties represented in the southeast Michigan guide, TLD also covers all 15 counties in Michigan’s Upper Peninsula, 11 counties in northeast Michigan and 10 counties in northwest Michigan, totaling 45 counties across the state in two publications with a circulation of 80,000 copies. Inside the thirty-six page guide, consumers will find maps and listings of hundreds of farms and local food businesses. There are also directories of farmers markets, community-supported agriculture (CSA) farms, locally made beverage businesses, and stories about the people and organizations creating a thriving local food movement in southeast Michigan. Beyond the guide, TLD offers a basic set of marketing resources to farms, farmers, and farmers markets at no cost. Additional marketing support can be added using an inexpensive fee-based system. Value-added food producers, food hubs, restaurants, retail stores, markets, wholesale distributors, schools, hospitals, and other large businesses can also benefit from TLD’s local food marketing strategies. All of this is available at a very reasonable cost, scaled to meet the needs of each business. The TLD Guide to Local Food in Southeast Michigan will be available to the public free of charge starting on July 14th, 2016. Magazines may be found at participating farm stands, farmers markets, grocery stores and visitor centers. For more, information, please contact Tricia Phelps at (847) 809-7643, tricia@localdifference.org, or visit http://localdifference.org. For a print-ready version of this media release click here. Taste the Local Difference® is a social enterprise of the Traverse City-based Groundwork Center for Resilient Communities. For more than 20 years, Groundwork has focused on three areas to create stronger, more vibrant, and resilient communities: transportation, clean energy, and food and farming. Groundwork’s Taste the Local Difference® program is a recognized leader in developing new models for local food systems in Michigan and elsewhere. Taste the Local Difference® (TLD) is a local food marketing agency based out of northwest Michigan. For over twelve years they’ve been promoting local farmers and food producers through the power of collective branding and storytelling. TLD differentiates local product on store shelves and throughout the community to ensure consumers consider the local options they have when making purchasing decisions. One of the ways TLD promotes local food in the community is with their annual print publication, The Guide to Local Food- published in partnership with MyNorth/Traverse Magazine. This guide is a free resource for the community and is distributed in grocery stores, community libraries, visitors bureaus and hotels. 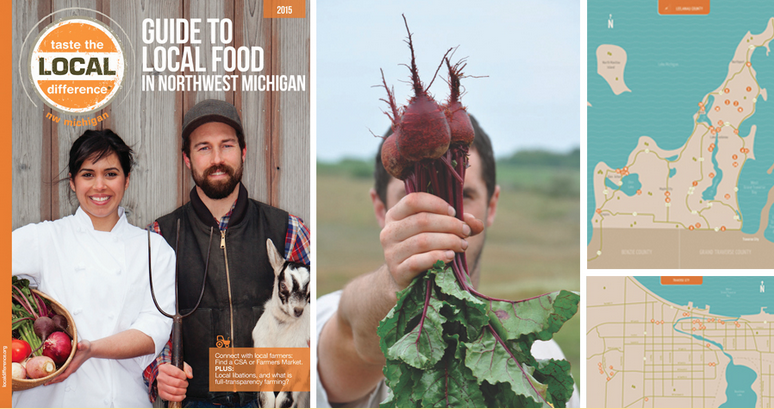 In 2016 TLD will distribute 50,000 copies of The Guide to Local Food— they’ll be doubling it’s size and adding content to cover all thirty-seven counties of northern Michigan, including the upper peninsula. Only TLD Partners are listed in the Guide which helps consumers to connect with local food & farms. The deadline to sign-up as a TLD partner and get your business listed in the 2016 Guide to Local Food is February 1, 2016— less than a week away. TRAVERSE CITY – Taste the Local Difference®, Michigan’s local-food branding and marketing program, will expand its services to farmers, food processors, food purveyors, and communities across Michigan starting in January 2016. Download a PDF of the full release here. TRAVERSE CITY – Taste the Local Difference®, Michigan’s local-food branding and marketing program, is adding Washtenaw County to its service area. May 15, 2015 (Traverse City, MI)—Taste the Local Difference launches its 2015 Guide to Local Food in Northwest Michigan. MyNorth Media partnered with Taste the Local Difference to realize the 50-page publication that connects readers to Northern Michigan’s vibrant food community with the mission to sell more locally grown and made food. Enter your email address to follow the Local Food Companion and receive notifications of new posts by email.